Introductory video of Soundgrain at Vimeo.com Here. Trajectory drawing video of Soundgrain at Vimeo.com Here. Granulation controls video of Soundgrain at Vimeo.com Here. 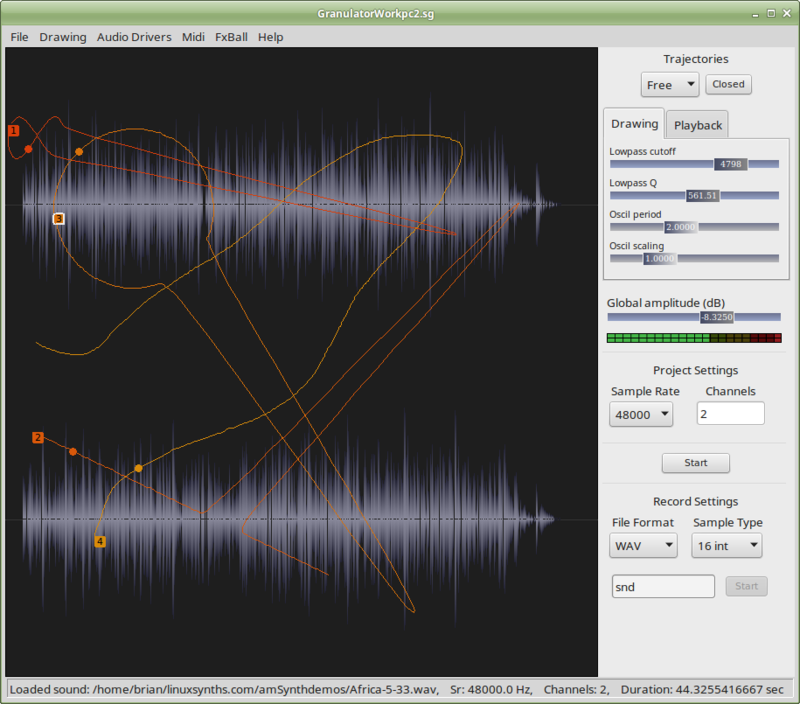 Soundgrain is a linux-based application Designed and maintained by Olivier Belanger, which uses a graphical interface to draw and create trajectories with which to reproduce wave files. It is available in many linux distro repositories. (It is also named 'Granulator' in some places.) It can also be obtained from Github and AjaxSoundStudio websites (see links at bottom). Soundgrain interfaces well with both Alsa and Jack, and there is an 'Audio Drivers' drop-down menu that indicates what sound driver options are available to choose from. Midi controllers can also be connected to Soundgrain in order to 'play' the trajectories in realtime. Soundgrain uses user-drawn trajectories to interpret any .wav or .aiff audiofile as 'grains' of audio (granular synthesis). Soundgrain's interpretation of an audio file can then be modified in a number of ways. The trajectory can be drawn as free lines, circles, oscil or straight lines. Free lines can also be looped by clicking 'close.' The File drop-down menu includes an Envelope Window to control the overall amplitude shape, as well as an Fx Window which gives access to the Granulator Controls, for adjusting the grains to be reproduced: number of grains, grain size, transposition, grain duration randomness, etc. The amount of 'flexibility' allowed to a trajectory can be selected by clicking Drawing -> Edition Levels. The more levels, the more dramatic the type of trajectory modification allowed. The FxBall drop-down window allows to add effects layers to the audio file. The effects provided include but are not limited to: chorus, delay, reverb, ring modulation, frequency shift, harmonizer. You will need to utilize wave or aiff soundfiles that you can import into Soundgrain in order to create patches. There are several places to obtain free sample files online, such as Musical Artifacts and Freesound.org.